Over the last few years, I have been developing my interest in herbal medicine in an effort to better support my patients, especially those aging animals that have difficulty with prescription pain medications (often NSAIDS: non-steroidal anti-inflammatory drugs ). I have just finished the first year of a 2 year graduate course in Western Veterinary Herbal Medicine. The course is three quarters of a masters degree (not sure what I would need to do yet to get that last 1/4, but that’s not my biggest priority), by the end of the course I should be prepared to take a certification exam in veterinary herbalism, sponsored by the Veterinary Botanical Medicine Association (VBMA), and could call myself a “Certified Veterinary Herbalist”. More importantly, I hope to have some better answers for my patients and to understand the safety and interactions that are concerns with herbs. I am studying Western, as opposed to Chinese or Ayurvedic or other traditional approaches to herbal medicine, though we are touching on these and other traditions to round it out--fascinating course! The Western approach looks at the herbs individually first, rather than by complex formulas, and I felt that I wanted to get to know the individual plants and know them well before mixing them into formulas. Something that I really like about this course is that it is "integrative.” The course combines the modern, conventional approach to medicine with beneficial herbal alternatives for treatment, providing a scientific/chemical action approach, as well as incorporating traditional "ethnobotanical" information--that is, blending the traditional uses with what we currently know about how the herbs act on the body, making it a truly holistic approach, in my opinion. There is still much to be learned in the field of herbal medicine, and it cannot be assumed that just because they are "natural" they are safe, but with the long term use (often thousands of years) of many of these plants I feel better about them than many of the modern pharmaceuticals with their long lists of side effects. I am starting to see some real benefits in my patients whose owners are interested in this treatment option, and am finding more possibilities for supporting animals, especially those with osteoarthritis, liver, kidney and urinary tract disease, diabetes and other geriatric conditions that we sometimes feel helpless in treating. During this next year (2012) in my course, we will be exploring diseases and their herbal therapies in depth by system, so I am looking forward to more helpful options for allergies and skin disease, inflammatory conditions of respiratory and gastrointestinal systems (more help for those vomiting cats! ), and much more. This is not a cure-all, but it does give me another tool to support my patients--those with active disease and as a preventative measure. Also, I get to play in my garden and call it "work"! If you have any questions or are interested in what herbal support can do for your pet, please contact me for a consultation. Your veterinarian is a published author! 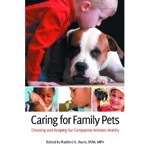 I am happy to announce that I have a chapter in the newly published book “Caring for Family Pets: Choosing and Keeping Our Companion Animals Healthy” edited by Radford G. Davis, DVM, MPH. You might recognize the name of the editor... I had initially declined, but found that the chapter he needed was really just what I do every day, so I wrote chapter 2: “The Responsibilities of Pet Ownership”. We hope it will be a useful book for pet owners - it covers everything from choosing and caring for various kind of pets, health and disease, first aid, nutrition, behavior and training, therapy animals for humans, alternative medicine options, and disaster planning with pets in mind, plus additional resources (books and websites) for more detailed information. No, he didn’t pick the cover photos, but they do lead to some nice public health discussions! The companion book is also coming out this month: “Animals, Diseases, and Human Health: Shaping Our Lives Now and in the Future” also edited by Radford Davis. 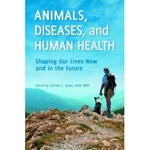 This book focuses on topics that touch on One Health, the connection between animal health and our own health. Chapters include dog bite prevention, infectious diseases we can get from our pets, emerging diseases, wildlife smuggling, animal visits to human hospitals, One Health, and animal abuse and the link to human violence. Also, you need a plan for your family to meet under different emergency situations, this includes what to do about your pets. I tell my kids that I will not worry about the pets until I know that they are safe, so there will be no running back into the burning house for the hamster! Their job is to get themselves out and stay where I can find them. Having carrying cages easily available, leashes handy and a travel kit of basic pet supplies (including food!) can make things go smoother. So here’s your reminder to make those supply lists and disaster kits just in case the power goes out this winter or zombies come to your door this halloween! I have just returned home from the annual conference of the American Holistic Veterinary Medical Association. What a wonderful group of people, with more hugs than any other veterinary meeting! It is so nice to be with a group of people whose goals are to support and maintain animal health. All veterinarians have this goal, but sometimes in medicine we spend more time treating diseases than preventing them. Preventative care is a large part of what I do and I would much rather see you all for annual or semi-annual health checkups than to see my patients when they are ill. As always, the foundation of maintaining good health is nutrition. I have a repeated conversation that I would like to share, and this has been brought to my mind with some recent patients. I would love to see all of my patients, especially cats, eating more moist food in their lives. There is a real correlation with cats developing urinary problems and kidney disease, diabetes, obesity, constipation and other diseases when they are fed strictly dry food. Dry food is convenient for us, but the kitties are getting too much carbohydrate for an obligate carnivore and maybe more importantly, not enough water. Here are links to my cat care and diet sections with more on that. Microcystin toxin has been identified by the Iowa DNR in Black Hawk Lake near Lake View in Sac County, Iowa. This is not an uncommon summer occurrence when the standing water in the lakes or ponds, high nutrient content and the heat create the perfect conditions for blue-green algae (cyanobacteria) to grow profusely creating “algal blooms”. These blooms can be many inches thick and usually float to the top of the water and cause the water to become cloudy. Microcytin toxin is released from the algae and can cause illness in animals or humans that swim in contaminated water. Ingesting large enough amounts of the toxin, such as animals drinking from the water’s edge where the algae accumulates, can even cause death. The toxin affects the liver and can cause signs such as weakness, loss of appetite, pale gums, confusion or behavior changes, and survivors may experience photosensitization. Of course, if you notice any of these signs seek immediate veterinary care. So, I hope you are enjoying your summer fun, just keep your pets out of those really scummy ponds! Here is a link to more information on Cyanobacterial blooms at the CDC’s website. I have added in some new pages and links especially for the cats in our lives, as well as some new photos in the nail trimming and brushing sections of Pet Care. Click here to go to the new Cat Care section of this website. I would like to thank the stars of the photo-shoot, our own Sirius Black Cat (who generally goes by Siri) and James, just James (Jim or Jimmy if you’re feeding him). Also, my husband, Radford Davis, the photographer deserves some credit as well. At my recent Wheatsfield talk, I spent quite a long time talking about the different types of diets that people feed their pets and the search for “whole nutrition”. We talked a bit about raw diets and whole food diets. I could have spent the entire time on just that. I have added a page to my “Pet Care” section that discusses diet and nutrition for cats and dogs. It is a complex and controversial subject, and I do not claim to have all the answers. These are some things to consider when thinking about what to feed your pet and how to fit it into your lifestyle. Click here for the Healthy Diet information. I will be speaking at Wheatsfield Grocery store on Holistic Pet Care Tuesday, March 8th at 7pm. What does holistic care really mean? To me it means considering all aspect of a patient’s life, not just their disease or problem, but also their lifestyle, diet, personality and needs, and in the case of pets, the needs and lifestyle of their owners. Who cares for them and how do they accomplish that with everything else going on in their lives? Holism is one of those nebulous goals like balance or harmony. How can we ever really consider ALL that can affect us and ALL of the treatment options available? Just because it is a daunting task does not mean we should give it up completely. There are some simple considerations that can start us on the road toward thinking more holistically about ourselves and our pets. I only have an hour to explore this topic, but hope to discuss some areas such as diet, disease prevention, and the varying needs at different life stages of animals. Contact Wheatsfield if you wish to join this discussion. Seating is limited. Maintain good hygiene – this is our best defense against these winter colds and flus – throw away dirty tissues, wash hands before petting your cats and unfortunately, at least while you're sick, don't kiss your cat! Try to keep them out of the "sick bed" though that's always where they want to be. Call a veterinarian at the first sign of illness in a cat– weepy eyes, sneezing, nasal discharge, lethargy (I know, hard to judge in a cat! ), loss of appetite. Respiratory signs in adult, vaccinated cats are not normal. Early support with fluids and medications may help these cats. Again, this is a very rare thing for cats to contract the flu, but we can do our best to prevent it. Last year I met a lovely woman, Marlene Ehresman, and found that we have many shared visions. We share a love for animals, nature and wildlife and a desire to bring people back into connection with this important aspect of our lives. Marlene is the Executive Director of the Iowa Wildlife Center which is still a dream, but is certainly on its way to reality. The Iowa Wildlife Center has been donated a beautiful piece of land near Ledges State Park to build a wildlife rehabilitation and education center. To read all the details of their plans go to www.iowawildlifecenter.org. They are currently running a “Raise the Ribs” fundraising campaign to be able to build this dream. If you are a nature lover and want to support a local cause, I highly recommend this group! Marlene and others from the organization will be at the Wildbirds Unlimited store, 213 Duff Ave in Ames, on Saturday, February 12 10am-3pm and Sunday, February 13th from noon to 4pm. This fundraiser is ongoing, so if you don’t see them there, you can check their website for ways you can volunteer and/or donate. I am looking forward to all they have to offer our community. The AVMA (American Veterinary Medical Association) has a nice instructional video that shows how to brush your animals’ teeth with some tips on getting your pet to cooperate—including taking a slow approach over a few weeks time to get them used to the idea. I have a few photos in the pet care section with some ideas as well. It is important to use toothpastes specially formulated for pets NOT human toothpaste as this can make your animal sick. Brushing your pets teeth daily is ideal. If you can only manage it every 2-3 days or even once a week it is still helpful. As you build the habit and you and your pet become more comfortable with it, you may find it easier to remember a quick tooth brushing every day. Other things that help keep teeth healthy are dental treats and chew toys made to rub the teeth—the AVMA video has some good examples of these (click here). Good dental health can give your pet a happier, healthier and possibly even longer life. If you have any questions or would like some help getting started with a dental plan for your pet, contact me and we can spend some time on this during your next appointment. Welcome to my updated website with special thanks to my husband, Radford Davis, for helping me put it all together! My goal for this blog is to periodically add information & thoughts that I would like to pass along to my clients and friends. I frequently think of topics that I would like to share to improve the healthcare of our animals and also our relationships with them. Often times we don’t get to everything during appointments or questions come up later that I would love to share with more people. I welcome input and comments to help improve this process! I will send an e-mail announcement when more information is added. If you would like to be added or removed from my e-mail contact list, please let me know with a quick e-mail.